My name is Danielle, I am a wife and mother first and foremost, but I have recently decided to dedicate some time to my other love, Interior Design. I have always had a passion for design and the creative process. I grew up changing the layout and decor in my room on a regular basis, always keeping in touch with the latest trends. As I’ve grown my tastes have changed, I tend to shy away from trends and focus on designing timeless spaces that will grow with the user. I graduated with honors from the Interior Design program at Lethbridge Community College, it was there that I fell in love with residential design. My practicum turned into a full-time job, but life had other plans, I soon became a mom and decided to put my career on hold to raise a family. 14 years passed, and I kept coming back to design, I dabbled here and there with my own projects and helped friends and family with their design dilemmas. I love every step of the design process, the planning, playing with floor plans, selecting the finishes and following the construction progress. There is something satisfying about having all the pieces of a puzzle fall into place. My design philosophy’s foundation is simplicity and elegance. I am drawn to neutral palettes and lots of texture. I love black and often incorporate it into my designs. I feel a space should reflect who you are but still be inviting to those you share it with. I am excited to share this journey with you. Follow along as I share some of the projects I will be working on, some design tips, ideas and inspiration and if your lucky maybe even a little DIY. Check back often for new ideas and content or subscribe below! 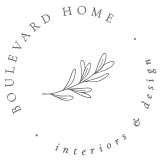 Boulevard Home is not just a business name it has evolved over the past 10 years as we have built three homes, each one strengthening my desire to immerse myself back in to the design industry. The latest build is somewhat of a passion project, and the inspiration for this business. I will be featuring it on my blog, sharing our DIY projects and how we have personalized the spaces as we turn this house on the boulevard into our Boulevard Home. When I took on a mountain home rebuild project for a family friend, it fueled my passion to help others and offer my services as a designer. I am based in Airdrie and specialize in residential design. I offer design consultations, guidance through renovations, and assistance to other designers. I work collaboratively with the client, and key contributors to navigate the design process, develop spaces that are beautiful and functional all while helping you create your very own Boulevard Home. Sign up with your email address to receive design tips, inspiration & resources.